New Study Suggests Dolphins and Whales Scream in Delight! Anyone who visits DRC experiences how vocal the dolphins are during their sessions and when greeting guests. It has always appeared to us that they did so in happiness. A new study now explains the science! Check it out here. We can't wait to see Sandy's finished crowd splash! After seeing the dolphins and sea lions show off, guests often ask “How long does it take to teach them?” That is an excellent question and the answer depends on the individual. Sandy is learning something brand new that is a great example of how many steps are included in the training process. As a 35 year old male; Sandy has come up with some awesome behaviors on his own. He’s the only dolphin that does a full belly flop and often steals the spotlight when he shows it off. While knowing a few amazing behaviors is great, we like to continuously challenge the dolphins both mentally and physically and add new twists to familiar behaviors as well as teaching something entirely new. Sandy is in training to learn a behavior some of the other big males know, his crowd splash. The end result of asking a dolphin to do this is a lot of wet guests, but in the hot Florida Keys sun it’s pretty refreshing. However, to do this there are several steps a trainer has to work out with the dolphin. The first of which is how to swim on their side while still moving forward in a straight line. Dolphins use their side flippers, called pectorals, to steer. This is how they are able to do such amazing turns and spirals. Sandy has to use his pecs in conjunction with his peduncle and ab strength to get the right angle in his swim. His trainer, Jamie, uses a target pole to teach him to wiggle his body in the correct way. He’s almost learned how to do it but still needs reminders on occasion. Once he’s got that movement down, she’ll ask him to put some strength into his kick so that he can give his crowd a splash. Once he has that combination down, the next thing is take the speed up a notch. Crowd splashes are fun because they come out of nowhere. You see a trainer station a dolphin and ask for something, then before you know it, you’re soaking wet. It’s the sneak attack that makes it so fun! We have no doubt this big guy, who is nearly ten feet long, will learn this behavior and enjoy it. He’s a goof to begin with, so something this fun is right up his alley. Just think, one day you’ll be relaxing by the back causeway, and then before you know it you’ll be splashed by Sandy! It’s literally going to be a blast. As a member of the Alliance of Marine Mammal Parks and Aquariums, Dolphin Research Center provides the best care for our resident #dolphins. Serving as ambassadors to their wild counterparts, the dolphins need your voice to stop the Japanese drive fisheries. Help us put an end to the slaughter of dolphins. Visit www.dolphins.org/hot_topics to learn how. Check out Delta, Flagler and Louie (plus Luna). Every year, we welcome new faces to the DRC family in the Volunteer Resources Department. Some are snowbirds who spend the colder months down here in the Florida Keys, while others are college students or graduates looking to get some hands on experience in their field of interest. Recently, we welcomed a group of interns who volunteered several years ago who came back to visit their old stomping grounds. The pair of interns, one from the Animal Care and Training Department and another from the Research Department came by to see both their human and animal friends. Much has changed since the last time they stepped foot at DRC. The dolphins had different living arrangements. Two more calves, Diva and Windley, were born. Animals, both dolphins and birds, knew behaviors that they weren’t even close to learning last time they were here. So much was different, yet still the same at the same time. We know from experience that the dolphins remember old friends. We’ve had trainers who have left DRC for years come back and their old flippered friends greet them excitement. So it was no surprise that there were three boys who were very happy to see the old interns. Louie, Flagler and Delta, who now make up a small male group, seemed ecstatic to say hello. As the girls greeted their favorite dolphins, the three boys squealed! They made all sorts of noises and even swam away from the trainers to see the girls out on the causeway. The interns were so excited that the boys remembered them. We hear stories about things like this all the time and how special it is. Our dolphins touch the lives of so many people every day. We’re very fortunate to have such an amazing flippered family who make connections with all of us. As the Flipper granddaughter, Gypsi knows she reigns over what goes on during sessions. It’s very rare for her to decide she doesn’t want to hang out with humans, because she is one of our resident people watchers. She’ll spend hours eyeing up guests and then scream at staff members when they walk past the front lagoon. Since she is such a social butterfly, her trainers thought she’d be interested in switching up a few things in her day to say experiences. Something we do with all the dolphins, once we see what activities they prefer. The trainers get in the water with the dolphins to work on their relationships as well as to see what new ideas they can come up with for mental and physical stimulation. During their interactions, the trainers noticed Gypsi’s eagerness to do imitations away from the dock or submerged platform. 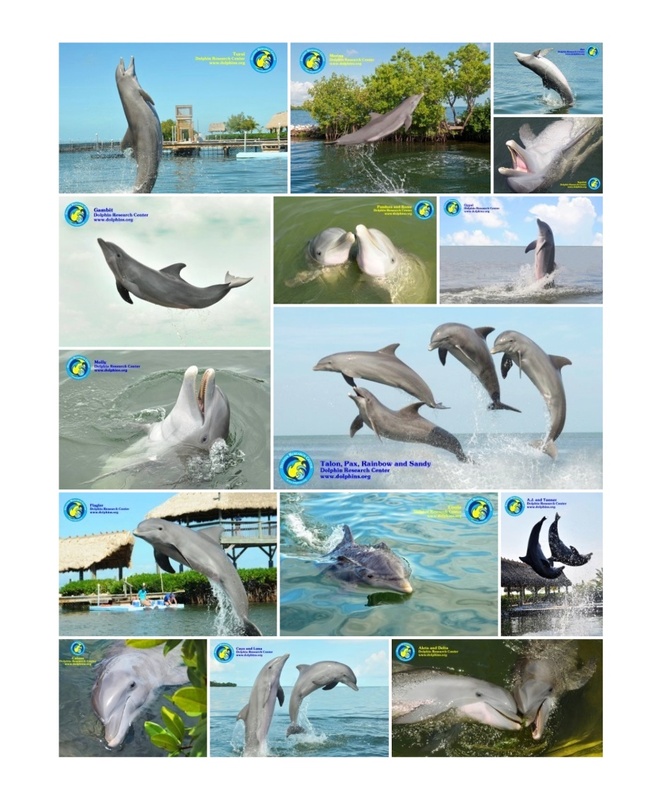 Since we want to make every experience fun and exciting for both the dolphins and human participants, Gypsi helped in our decision to incorporate more in water options. She has already mastered how to do the imitations, including having people swim on their back and kick their legs up and down while she does the same with her flukes. We really think she enjoys this switch from the usual submerged platform interactions. She’s one of the first dolphins partaking in this, since it’s very much her style, but we’re slowly testing the different dolphins’ interest level. Obviously, their lagoon is their home and we want them to feel comfortable at all times. However, everything depends on what we see the dolphins enjoy. While Gypsi is the most interested, one day she decided she wasn’t into it. Instead of doing what she was asked, she’d swim away to join a friend at another dock or simply not do what she was asked. That’s perfectly fine. The dolphins’ interest level is DRC’s number one priority. Hanging out with a dolphin is fun, regardless of what you’re doing so Gypsi stuck to her usual way of playing with guests and all had a brilliant time! September 7- 15 is National Suicide Prevention Week. In an effort to raise awareness about Suicide Prevention amongst our soldiers, Susan, a DRC supporter took part in The 8030 Project. Individuals raise awareness for suicide prevention by centering their images around the number 22, the average number of soldiers that lose their lives on a daily basis. We were happy to give supply her with photos of our dolphin family, which she used to make a beautiful collage. You can view the dolphin collage and other tributes to our service men and women on The 8030 Project blog. Throughout the year, we invite warriors to Dolphin Research Center to interact with the dolphins. The experience offers respite from the troubles they face on a daily basis as they ease back into civilian life. These encounters offer positive memories for the soldiers, which we hope anchors into their lives and continues to grow. For many of our heroes, this day is shared with friends and families. We are always honored and humbled to give back to our heroes. Each experience with them is as refreshing as the first. It's amazing to see men and women, who face a variety of challenges, put their guard down, relax and enjoy dolphin time. Their smiles glow as brightly as the sun and their joy radiates throughout the facility. If you would like more information on the programs we offer for soldiers, please click here to go to Special Needs portion of our website. An interview between Jax, the dolphin, and Oliver, the dog! Have you ever seen a conversation between a dog and a dolphin? Well, look no further. Our very own Jax, a rescued dolphin who was attacked by a shark when he was under a year of age, shares stories about his life here at Dolphin Research Center, meeting veterans through the Wounded Warrior Project, and a bit more with Oliver Bovello. Check it out here! At Dolphin Research Center the entire family is crazy for football so we had to share this awesome photo that truly sums up our excitement! If you feel the same way, or just think the photo is super cute, please share it on your timeline via our personal Facebook page. Not only is it as easy as a click of the button, but your direct shares help us share our mission of teaching, learning, and caring for marine mammals and the environment. Plus, you'll also get to learn more about the family while seeing beautiful photos of them! Don't have Facebook? No worries. Our business page is public, so you don't even need an account to see what's going on with the family. Just bookmark it and take a virtual walkaround of our facility whenever you have spare time.We update daily, so make sure to visit it whenever you can.